To play Mp3s on your computer you need software. There are several hundred programs to choose from. Our top pick is Sonique. Cool, popular, best interface in town. 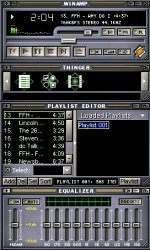 Second place is Winamp. Probably the most widely used Mp3 software program from the always-delirious Microsoft. And runner up is Ashampoo, who were so bold as to give an utterly irrelevant name to their program.